Clear File's Archival Plus Negative Page is their best selling negative page. High gloss, highest clarity. Fits oversize ring binders and albums only. Proudly manufactured by Clear File in the USA. Box Dimensions (LxWxH) 15.1 x 8.85 x 0.75"
Archival Plus Negative Page, 35mm, 10-Strips of 4-Frames - 25 Pack is rated 4.3 out of 5 by 12. Rated 4 out of 5 by DAE from Great for negs from the drug store Great for negs from the drug store, since they're usually cut in strips of 4. It's easier to find binders than the ominous oversized binder warning makes it sound. These fit perfectly in legal sized binders, which most office supply houses carry. Note that the legal binders come either in four-ring or three-ring versions; these will fit in either of those, but if you have other three-ring sheets you need to store with these negative sleeves, make sure you get the three-ring versions of the legal binders. 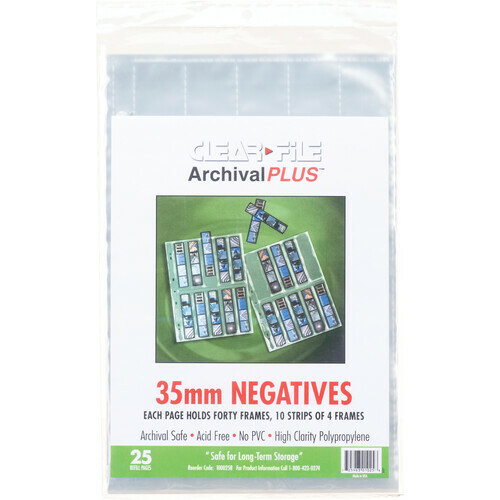 Rated 3 out of 5 by bob from good layout, but beware the overall size this page provides good coverage if your negatives are cut into fours, but be aware that the page size is larger than the pages for 7x5, making it awkward to fit in the same storage book or box. I didn't realize this until it was too late. I also bought the Beseler archival plastic box to store all my negs in, but this size does not fit in that box well at all. Rated 5 out of 5 by D. Burke from Does Exactly What It's Supposed To Not much to say here really...the pages do what they say they do. They hold the negatives securely so they don't slip out. No cons as of yet. Oh, I didn't have a binder handy that was the proper size for the pages, that was a bummer. Rated 3 out of 5 by The Traveller from Not the best, but it works fine I prefer other products, but to save money I'm using these. I do love the way they have arranged it so I can store negatives that have been cut into 4s, without using two pages; and since it is archival, I'm satisfied. Rated 4 out of 5 by Brooks from Works well and a good price Does just what you'd expect, keeps my negatives clean and safe. The sheets are a little taller than sheets I've gotten from other brands, so they may not fit in smaller notebooks. Rated 5 out of 5 by Too big from Too Big I bought these negative protectors because I liked how they were held vertically. The reason I do not like them is due to the fact they don't fit in a normal sized binder.